Rock and tree. Together. Reliant on one another. Without the rock, there is no tree. If the tree grows too large, the rock will be split asunder. Where sheep graze the best place for a tree to take root is often in the cleft of a rock and that’s what this Rowan has done. It looks skeletal without its leaves in the winter, a craggy, sorry, hanger-on. But in the summer in a flush of green, and then aglow with red berries, it is transformed to a queen of trees, and its placement in front of the rising and folding of land around it accentuates its curves. Behind it, the craggy sides of the Tongue rise sharply, dotted with birch and ash trees, visited by peregrines, pigeons and crows. In front, the wide flat floodplains of the Kentmere Valley stretch eastward, defined by the river and the rich green of inbye grazing fields. In evolutionary terms, rowan trees settled after hollies and before the hawthorns. Their smooth grey bark gives them an air of calm and gentleness while they get on with the serious challenge of making the best of growing in cold hard environments; and they celebrate this achievement each year with a throng of red. We’ll be picking up on the theme of red, using raddle from a local farmer to stencil some words onto the rock – but that’s another story. This tree took us by surprise. 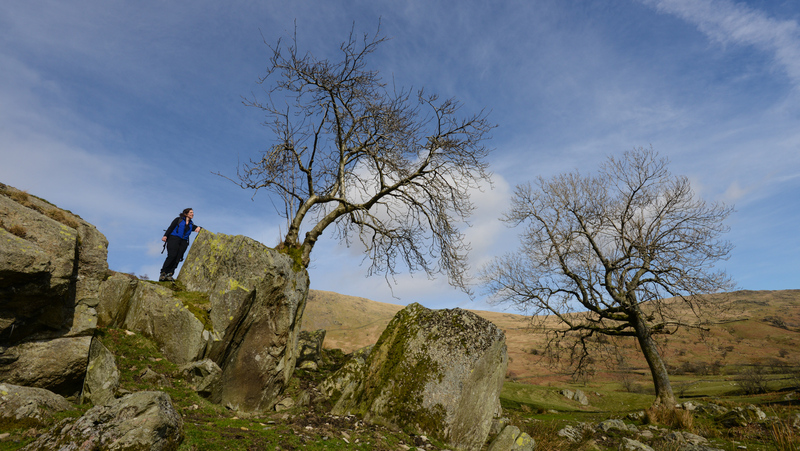 We know this valley well but in search of a tree had first walked up to the higher points of the Kentmere Valley, up to Kentmere Pike and Harter Fell, and come down Nan Bield pass. We’d just had an unexpected sighting of a group of young badgers bouncing around in the soft grass. It was an unusually hot day for March and we headed for a deep spot in the river and took a dip. Early in the year, yes, but refreshing and, well, it has to be done when the sun is strong. We had passed several trees but nothing sung out to us until we came to this spot and there it was – leafless but remarkable, high up on a rock with its roots snaking through the crevices. We had a bit of a discussion. The alder close to this rowan is equally remarkable, hollowed out and holding within its trunk a view of the fells but the rowan won out for us in the end. A second visit in summer showed us just how dramatically a small tree like this can change. Another thing that makes this tree special is its place within this particular valley that we know so well, and the farming story it has witnessed year after year for centuries: gathers, lambing, tupping, clipping. There’s also the story of the river, which hides crayfish in its shallows, welcomes salmon in the autumn, and, after severe rainfall as was the case with Storm Desmond in December 2015, takes its power and volume into the heart of Kendal. We’ll be looking into all this and more as we get to know the place and its natural and cultural history more deeply. will the tree sit down and continue? 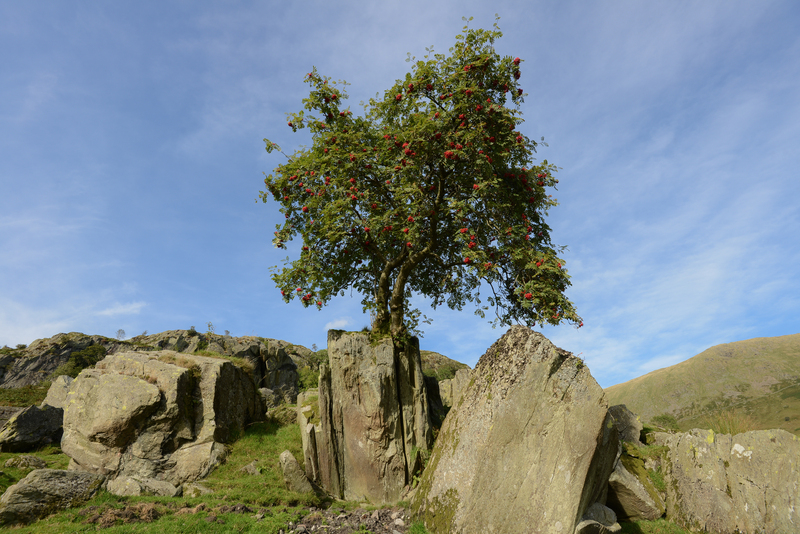 Join us for a walk in the Kentmere Valley, with a visit to this rowan. For more information on this, please visit our walks page. We will be blogging about tour walks to the Rowan and what we learn about the land around it, and share the links here. In winter we walked to the tree, taking a long route over the fell tops, as the sun rose – and discovered three dawns in one day. We have also visited it with school children from Staveley who came up with their own poem and made a video of their journey. The colour for the installation at the Rowan was red, made using the ‘Hardwick Red’ that farmers use to mark their sheep for showing. We walked in on New Year’s Day, 2017, to stencil a short verse onto the split rocks that surround the rowan. Read about it here – Rooted Well : Red at the Rowan.